Mogao Caves also known as the Thousand Buddha Grottoes, it contain the world’s largest collection of Buddhist art. The Chinese name Mogaoku / 莫高窟 meaning “peerless caves” or “none higher”. 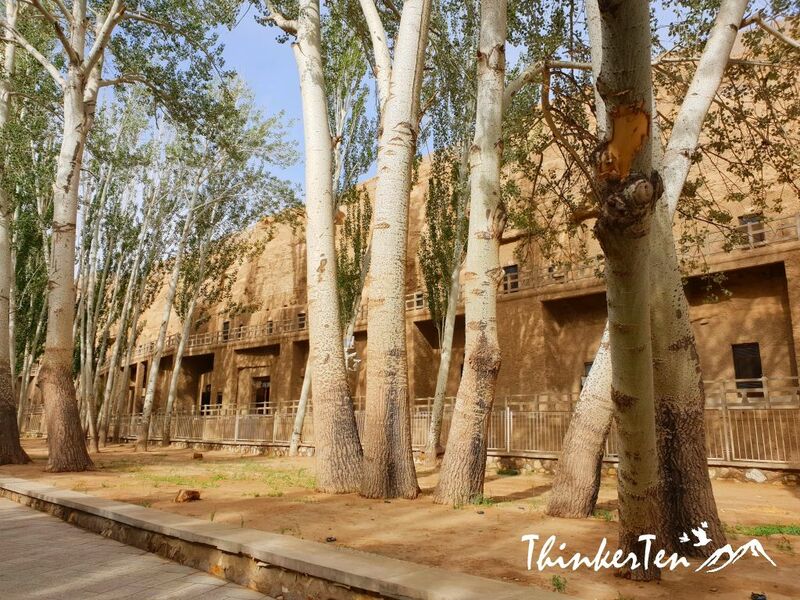 Mogao Caves is situated at a strategic point along the Silk Road, at the crossroads of trade as well as religious, cultural and intellectual influences. It is about 30 mins drive from Dunhuang city. 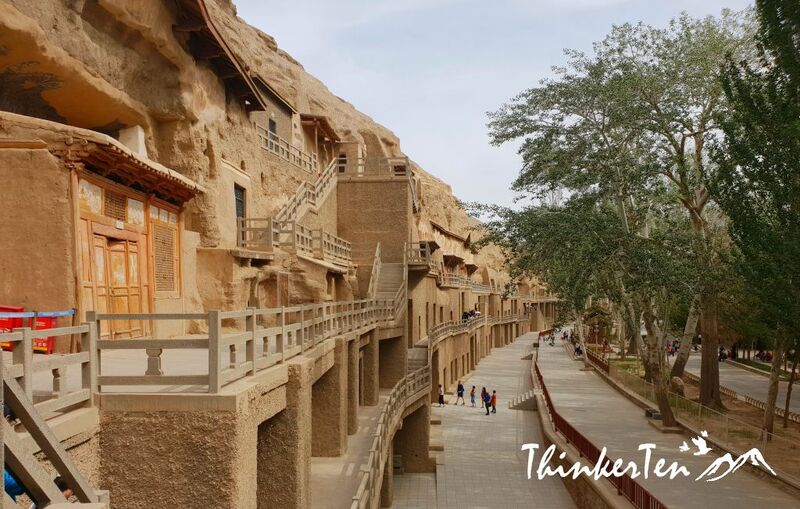 Mogao Caves is a Unesco World Heritage Site, getting tickets are challenging. The caves only permit 6000 tourist per day. Our tickets were reserved online in advance and picked up at the local agency a day before we visit Mogao Caves. Foreign traveler uses their passport document to reserve the ticket. 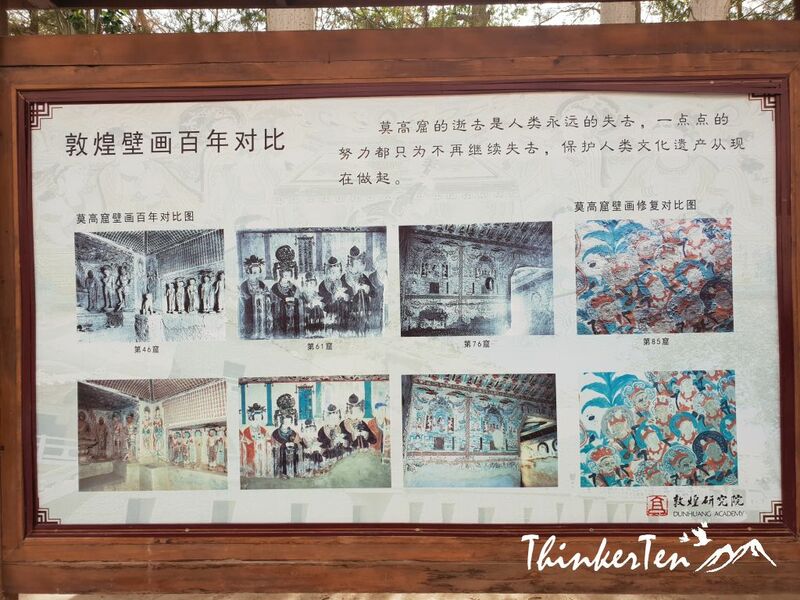 Before visiting the Mogao Caves, there are two movies at the Digital Exhibition Center : ‘A thousand Years of Mogao Caves‘ – Story of Mogao Caves & Dunhuang and another movie is ‘Splendors of Buddha’s Palace‘ – more on internal of the caves, the mural & structure. You may fall asleep by the Buddhist chanting during these movies. I fell asleep twice in both movies, not that it was boring, but due to the chanting sound which make me close my eyes and fell asleep. After the movie at the Digital Exhibition Center, immediately proceed to queue for shuttle bus to visit the caves. The lines for shuttle bus can be very long so queue immediately when the show ends and don’t go to toilet as there will be toilets facilities at Mogao Caves. The journey is about 10 mins to reach Mogao Caves from the Digital Exhibition Center. When you entered the caves, no photos are allowed. The Mogao guide use an electronic torch to show you the paintings and drawing of the murals inside the caves. How many caves are there in Mogao Caves? There are 735 caves and 492 of which have murals that are still well-preserved but we only visited few of them, less than 10. Mogao Caves are from the 4th century AD to the 14th so you know these are thousands years old treasure. These caves containing a colossal of murals and over 2,000 painted sculptures. There are caves at different sizes but most of the caves we visited are small caves. To have 30 people inside a tiny cave can be very crowded, we only have the space to stand. 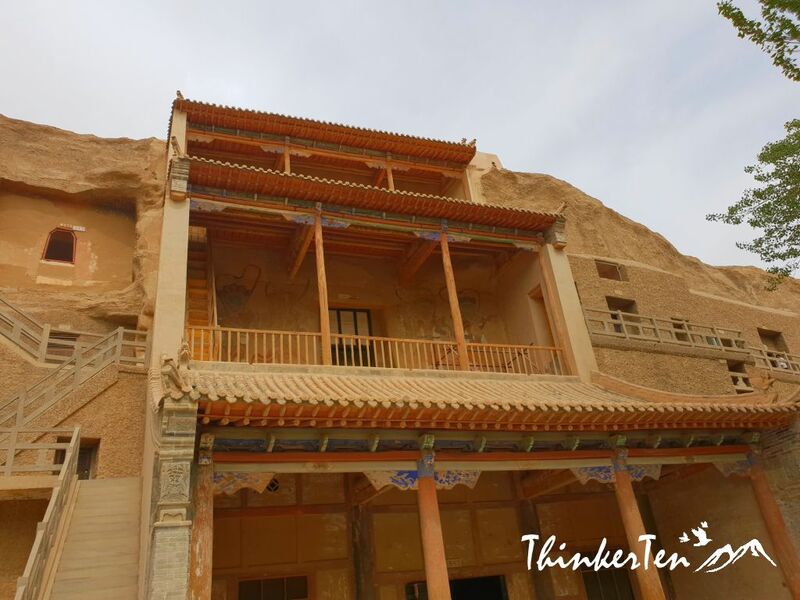 The Dunhuang Academy together with international experts Getty Conservation Institute (GCI) worked together to develop a plan to ensure the caves survive. There is even “Dunhuang Studies” because the manuscript left behind the library caves thousands years ago are just too many. The team of experts around the world would have to decode many of these left behind materials. Hence, there is Dunhuang Studies! Each cave is locked and only the expert guide has the keys to open the door of the caves and explain all the details of the murals and sculptures with a mini torch. You cannot walk around the caves at your own! Some statues inside the caves are over thousands years old so expect to see very run down and oxidized version. However you can still notice the incredible workmanship of ancient Chinese craftsman! Buddhism was the main inspiration, there are also influences from Persia and India. 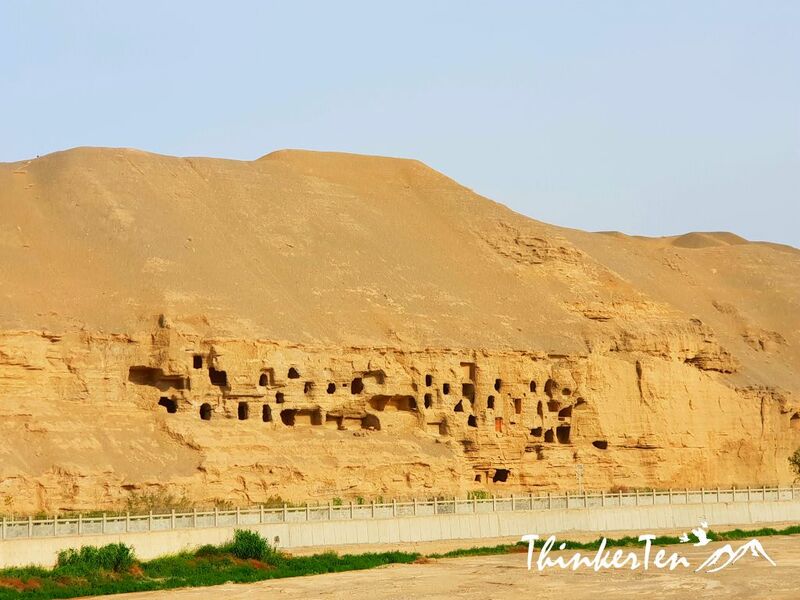 During the mid 4th century AD, Le Zun (樂尊), a notable Buddhist monk, intended to set up camp here by excavating caves and rooms of worship in the Mogao Caves. He wanted to provide a location for pilgrims to rest and meditate at while seeking spirituality. Over a millennium, these temple caves multiplied as pilgrims, artisans and monks left elaborate murals, sculptures and paintings within the 1000 individual caves and chambers. Chinese Government is claiming Mogao Caves as one of the ‘big four’ world-heritage attractions in China, alongside the Great Wall, Forbidden City and Terracotta Warriors at Xian. 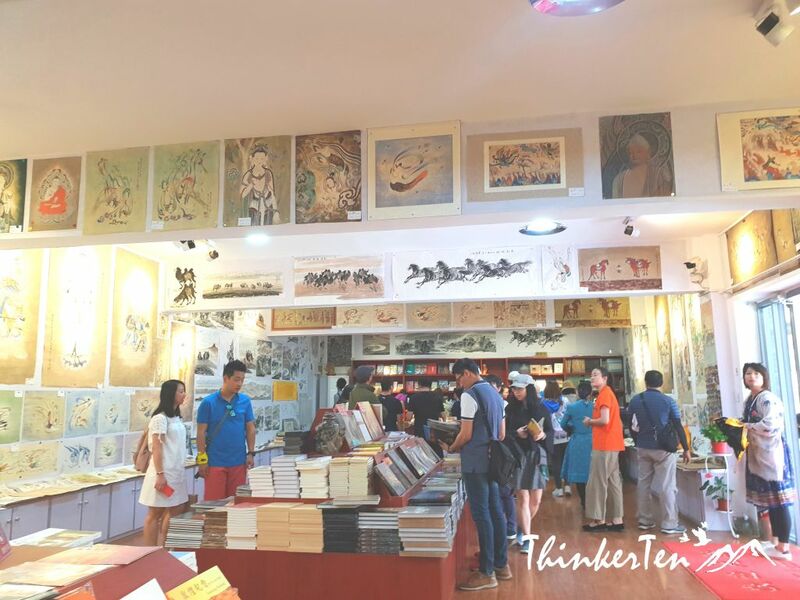 Visitors can also purchase paintings, scarfs or books from the book stores at Mogao Caves. The iconic character of Mogao Caves – ‘Feitain’ or Flying Apsaras’s painting can be seen displaying everywhere at the book stores. The Mogao caves provide great in-depth story into the world during the age of Silk Road. Don’t miss out this secret caves which has the world’s most incredible collection of arts. wow this looks amazing! I definitely need to add this to my bucket list. 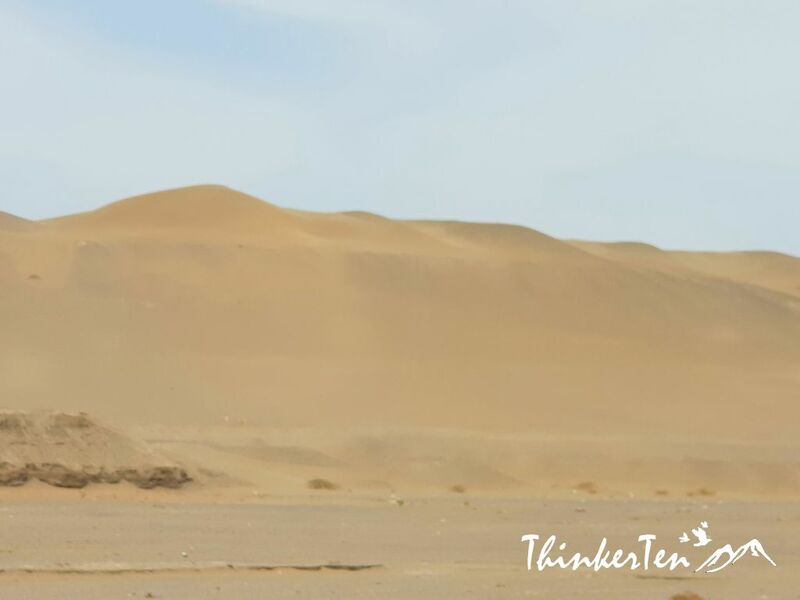 An amazing place hidden in the middle of desert near Dunhuang along Silk Road. If you go in the caves, you will find more bizzare things. Total of over 700 caves and about 500 are well preserved. Only few are open for public visitors and some are open for researcher around the world. I cannot wait to visit some day … Loved all your pictures. Thank you for your comment. 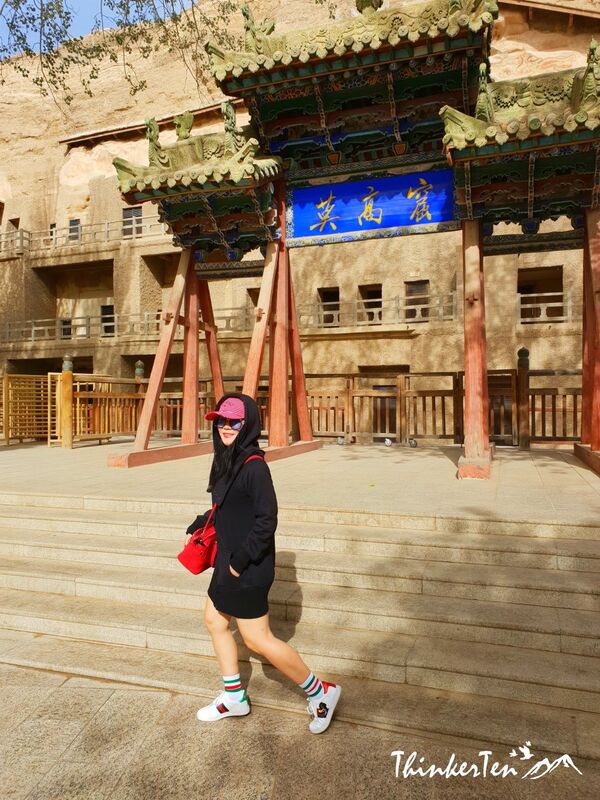 There are daily quota to visit the Mogao Caves, so do an online advance booking is a must. We gotten our tickets one day before our visit. You need to use your passport document for picking up of tickets. Wow! I had never heard of that place before. I am definitely adding it to the list! Dunhuang is one of the important stop along Silk Road China and Mogao caves mark jewel in Silk Road. The caves was used as an accomodation and place to rest or for meditation for the monks thousands years ago. These intricately designed caves are so interesting! My family would really enjoy exploring these! The Mogao Caves is certainly worth a visit as there are so many art piece which was left down thousands years ago. Mogao caves look so fascinating. They must have witnessed so much of never known history. There are just so much to tell and yet to decode from the treasure left behind in Mogao Caves, imagine over 50,000 of manuscripts was found. It certainly takes a lot of man power to decode these manuscripts. China itself is not enough and in fact researchers around the world came by to render their help to sort out this material. 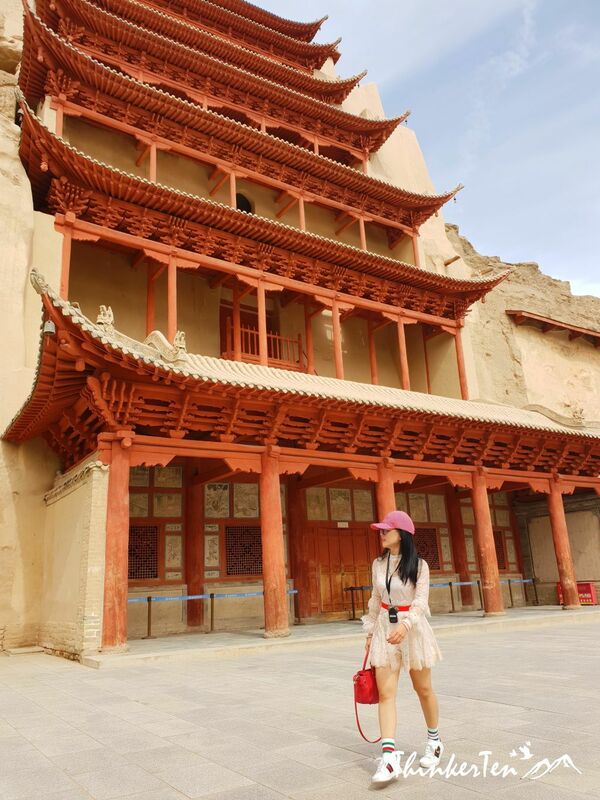 The Mogao cave of Dunhuang have been shaped by more than the artists and builders who crafted the site over the course of a thousand years, so there are plenty of history no doubt about it. This place looks amazing. I can’t wait to visit Mogao Caves. It’s now on my bucket list. The cave-temples are all man-made, The wall-paintings were done in dry fresco. The walls were prepared with a mixture of mud, straw, and reeds that were covered with a lime paste. The sculptures are constructed with a wooden armature, straw, reeds, and plaster. The colors in the paintings and on the sculptures were done with mineral pigments as well as gold and silver leaf. Look at the details and you will be amazed how intricate these were made thousand years ago! Oh my, this looks amazing. I bet it was awesome to explore the caves and learn about all the history and culture! The left behind material/manuscript (over 50,000) or artifacts left behind thousand years ago; is like a Rosetta Stone for the researchers to decode. There is even “Dunhuang Studies” where researchers around the world come together to solve these puzzle and manuscript and translate to nowadays language. Many of the treasure or manusripts are found in other parts of the world, such as London, Paris and America. This is one of my dream trips! Thank you for letting me experience it through your words and pictures. 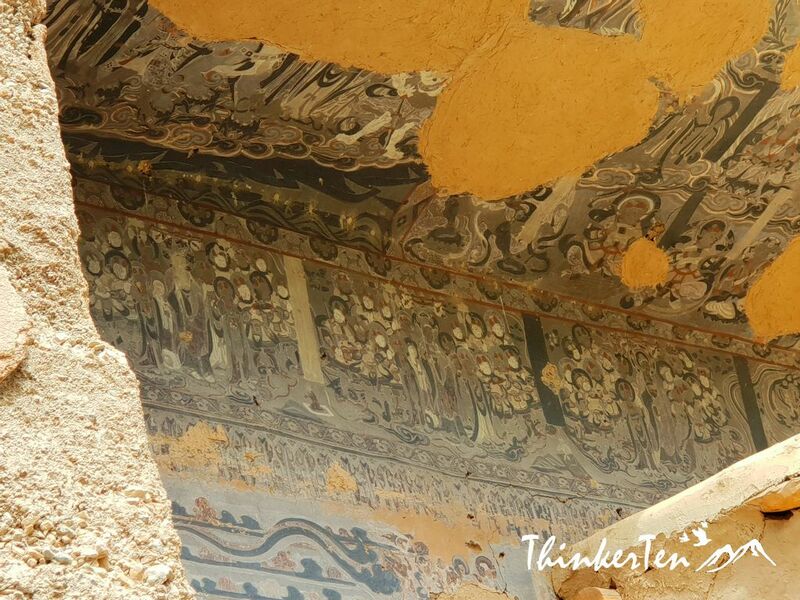 You will find the Mogao Caves a hidden place full of Buddhist art treasure, you get to see murals paintings and sculptures that were thousands years ago. Luckily the weather in Mogao Caves is “desert climate” so it is dry enough to protect these artifacts until now. Ahh, I would love to see this one day! Buddhist art is so beautiful plus exploring caves is super fun. 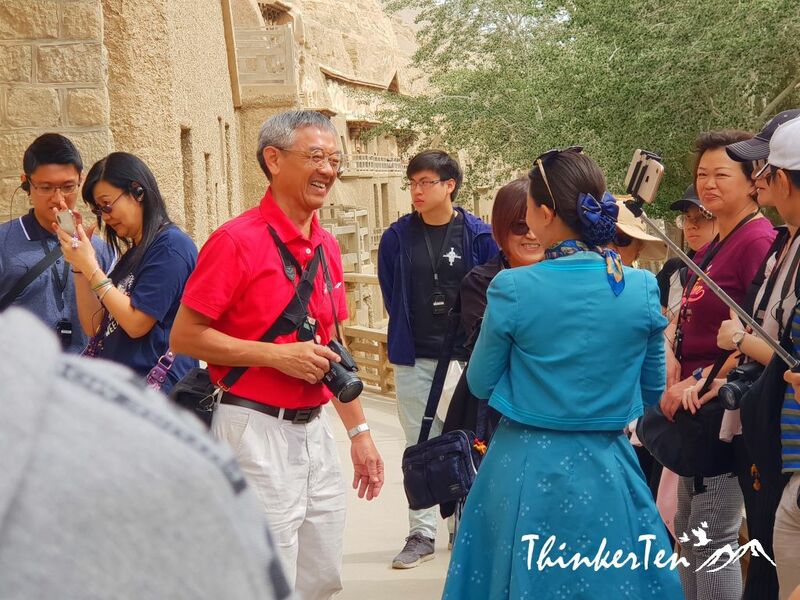 The caves that we explored for the tourists are well mainted with a locked door, only the Mogao expert guide has the keys to open these doors for us to visit. There are so many caves big and small sizes with different treasure inside and we only have time to visit a couple of them. What a prominent historic view. I love the old caves, I wonder how long construction took. This is one place i’d love to explore with my loved ones. Oh, love your cute outfits, too. The caves certainly took many years to dig and painted with beautiful Buddisht inspired murals that was thousands years ago. Wow the photographs look so beautiful! I have always been fascinated by caves and cant wait to visit these one day! You look adorable. Thanks for your comment. We visited several caves as not all are open to public, from an expert guide from Mogao Caves who hold keys of the door. The murals and sculptures inside Mogao caves brought us insight information on thousands years of culture at the crossroad of East and West. It looks like an amazing place to visit! I totally agree that Mogao Caves is an amazing place which are carved into cliffs about 25km from the oasis town of Dunhung on the edge of the Gobi Desert. Looks like a great place to visit! I’m gonna add to my list! I would love to visit there someday! The caves are a time capsule of the Silk Road, you see murals capturing the early encounters of East and Westare largely intact. Hence you see the mingling of Chinese and foreign elements on almost every caves wall. This would be fantastic to see. I was pleased to read that Getty is involved in keeping the murals safe. During my time in Asia, I often found many tourist attractions to be money centered. Good to know that you have been spending some time in Asia so you should know Asia well. I totally agree in most tourist attraction in China, there is a charge for entrance fees and the fees can be high! The mural painting, manuscript and sculptures are all thousand years artifacts and really thankful that Getty is helping to restore the caves. I had no idea that these incredible caves existed – what an amazing experience to be able to view some of the paintings inside and learn about their history. I didn’t know about those caves before! like at all! so excited to know more about it, thank your for educating me! Painted clay sculptures and murals in Mogao caves has mostly Buddhist themes, but they also include human figures, reflecting different societies and cultures of different times. Observed closely you will see integration of Chinese and Western arts. Thank you for sharing these amazing photos. Looks like a whole other world. Far away from city life. 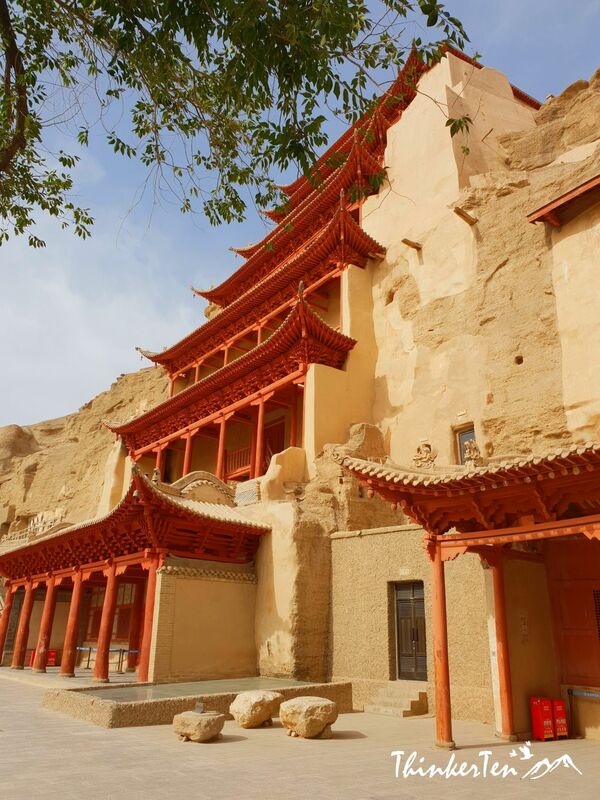 Mogao Caves is about half an hour drive from Dunhuang City, situated in the middle of desert. Pretty stunning view when we were approaching the Mogao Caves. The caves look so cool, also looks like you had a great trip, thanks for sharing! 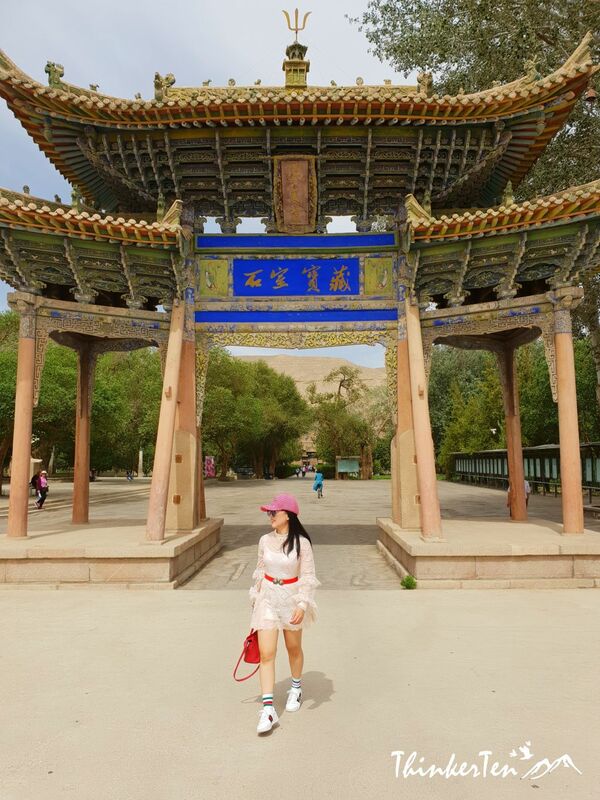 There are so many caves for visitors to explore but not without the Mogao expert guide as all are locked, only the Mogao guide has the keys for these door. Well, the caves has so many interesting painting and sculptures which were done thousand years ago. This place is unbelievable! I would love to see this marvel at least once in my life. 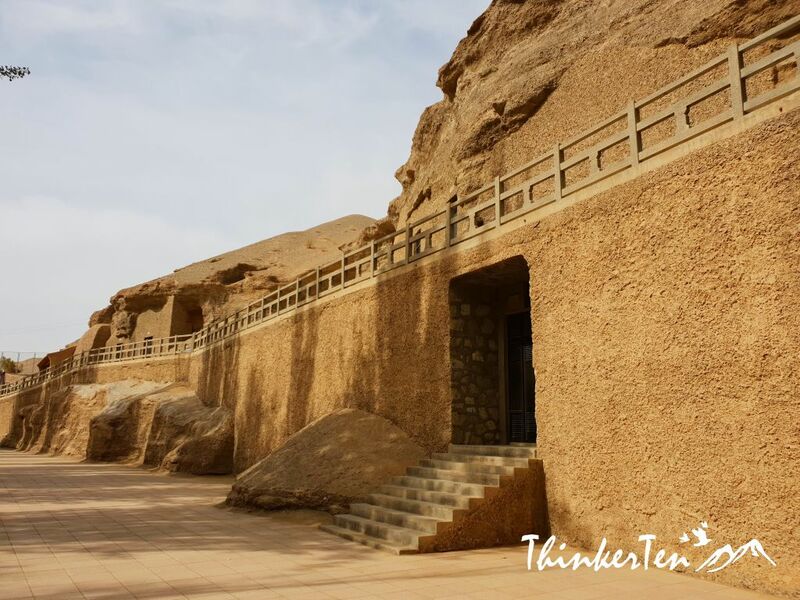 Tha Mogao Caves are the world largest and oldest treasure house of Buddist art, also known as the one thousand Buddha Grottoes. 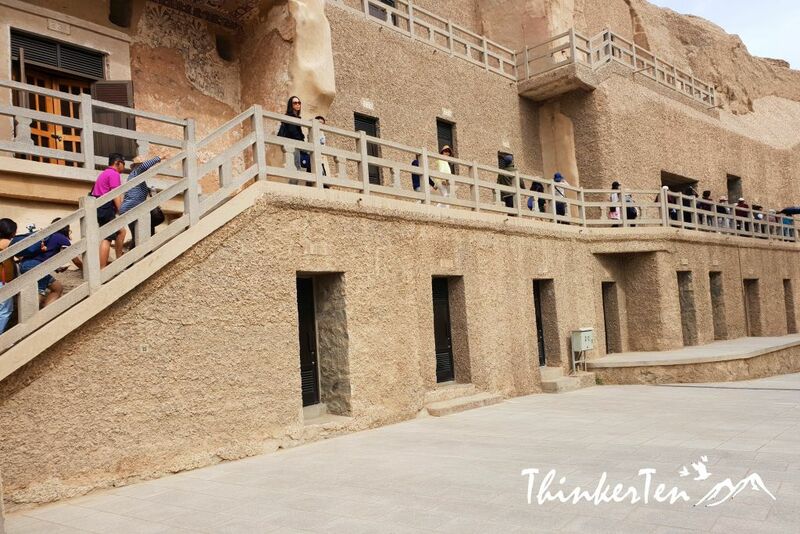 Truly a great place while exploring Dunhuang Silk Road China. These caves look so interesting. I would love to visit them one day. Thanks for sharing! I visited similar architect while I was in Japan. I love historical sites. Really? Many of the buddhism elements in Japan were originated from Mogao caves. I believe the things you see in Japan certainly has some similarities. More than 500 caves were dug and soon became a pilgrimage site for Buddhists, artists, officials, and many others thousands years ago. Inside a Mogao cave, a Buddha is generally the central component and is surrounded by other deities and heavenly attendants. Pretty stunning to see these arts work that was thousand years ago. What a gorgeous spot, and such a fascinating history. Thank you so much for sharing!